The Remote Communities Ceramics Network has been active for at least a decade providing exchange between Aboriginal clay artists across northern Australia. The latest results of this network can be seen in a new exhibition at Nishi Gallery in Canberra. Berder. Gaba. Urrknga. Wantja. 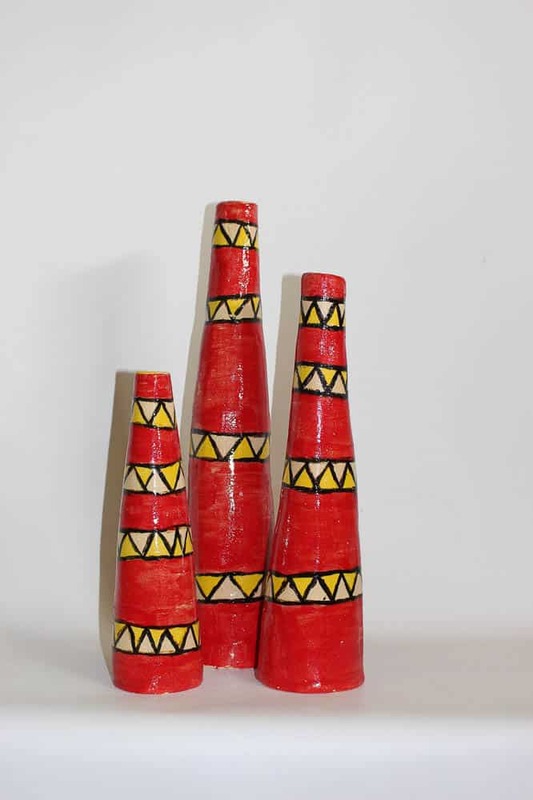 presents new ceramics from Aboriginal and Torres Strait Islands artists living in remote areas across Australia. The exhibition represents a north to south journey across the land; from Darnley Island in the most north-eastern part of Torres Strait Islands (Erub Arts), to Cardwell in Queensland (Girringun Aboriginal Art Centre), to Ntaria in Northern Territory (Hermannsburg Potters), to the Musgrave Ranges in the far north-west of South Australia (Ernabella Arts). 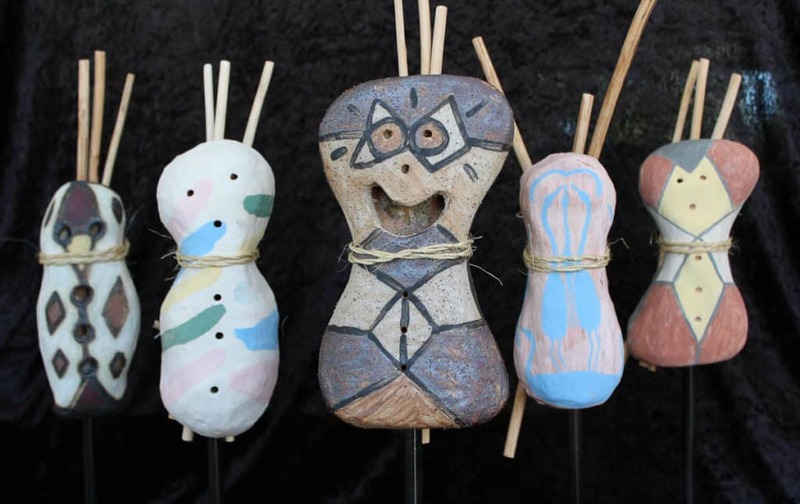 Together, these four art centres make up the Remote Communities Ceramic Network. The title of the exhibition describes the closest word for “clay” from each art centre. Berder is a Meriam (Torres Straits Islands) word for “mud”. Gaba is a Girramay, Jirrbal and Gulnay (Queensland) word for “white clay”; one of four ochre colours used to paint traditional objects. Urrknga is a Western Aranda (Northern Territory) word for “clay or dirty mud”. Wantja is a Pitjantjatjara (South Australia) word for “the hard, moist earth; the first sign of water when digging a soakage well”. Berder. Gaba. Urrknga. Wantja. depicts a kaleidoscopic range of narratives. The objects from Girringun depict the mystical spirit of fire. Erub Arts (Torres Straits) Erub Arts is an intergenerational learning space with specialist arts facilities. The Centre has developed a model of practice where creation, exhibition, research and education are intertwined activities. Creation takes place with groups of artists working collaboratively toward specific outcomes and are the result of ongoing, collection-based research. Girringun Aboriginal Art Centre (QLD) The Girringun Aboriginal Art Centre represents artists from the Traditional Owner Groups of the Nywaigi, Gugu Badhun, Warrgamay, Warungnu, Bandjin, Girramay, Gulgnay, Jirrbal and Djiru people. 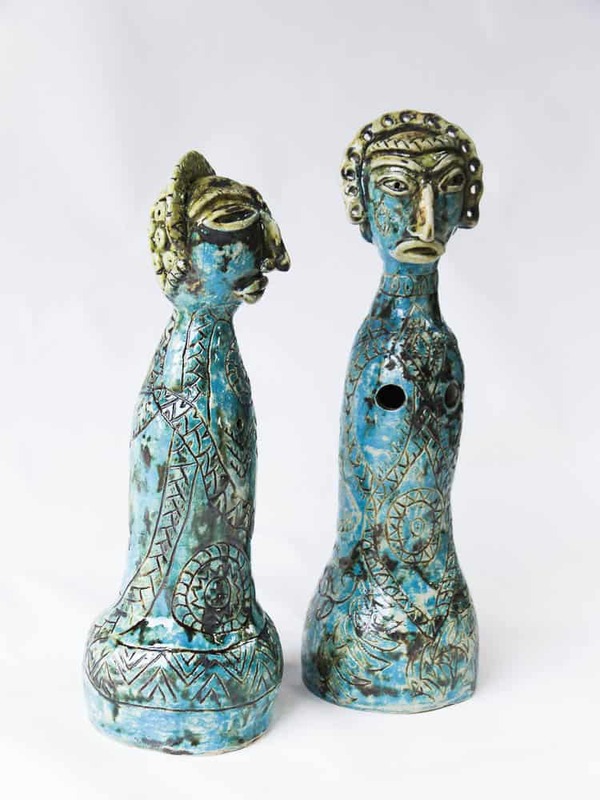 Emerging from the rainforest canopy and cultures that have spanned generations, the stories and environments of these ancient cultures are transformed into visual designs by weavers, painters, potters, textile artists and makers of traditional objects. Hermannsburg Potters (NT) The Hermannsburg Potters are a close group of Western Arrernte artists who have worked for the past 35 years in their community of Ntaria. Located in Hermannsburg, 130 kilometres west of Alice Springs, the hand-coiled terracotta pots of these artists are painted with vibrant depictions of their individual and shared histories in their country. Stories and events of the past and present interweave to present narratives characterised by adaptation, social shifts and the Arrernte artists’ keenness to learn and work with the new. Ernabella Arts (SA) Established in 1948, Ernabella Arts is Australia’s oldest, continuously running Indigenous Art Centre. Ernabella Arts is in Pukatja Community, at the eastern end of the Musgrave Ranges in the far north west of South Australia. It is Aboriginal owned and is a place for women and men in Pukatja to practice and develop their art, in order to sustain, support and promote their cultural heritage, and to improve the lives of community members. Nishi Gallery The Nishi Gallery is a cultural space in Canberra, Australia. It explores human experience through the lens of local identity, objects and their meaning; the natural and built world; design experimentation and artisanal making. Our exhibition programs support the subversive, the radical and the vernacular. Nishi Gallery is operated by Molonglo and programmed in collaboration with local, national and international artists and designers, creative and social enterprises, cultural organisations and independent curators. Crispin, Geoff. Remote communities ceramic network. Ceramics Technical, No. 30, May 2010: -.